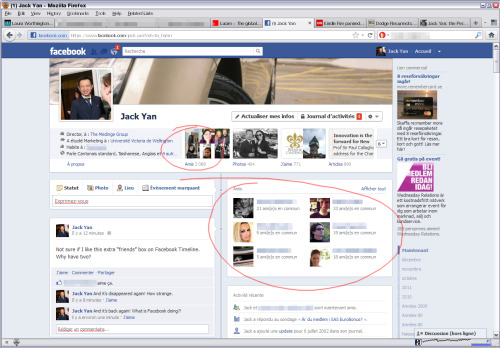 Above: My Facebook Timeline, as it appeared in October. As more of the planet gets on to Facebook Timeline, it’s been interesting to watch reactions. When Facebook went to a new layout three years ago, plenty of people—myself included—went to an anti-new Facebook group. Most were there because they didn’t like change, threatened to leave, and failed to carry out their threat. It was like those who said they would stop reading tabloids after the Princess of Wales died—as circulation rose the following year. I joined not because I disliked the change—I thought the redesign was quite good—but because Facebook never did any testing and we were the guinea pigs. The new design was about as reliable as a Wall Street banker, and given it kept failing, I joined to voice my opposition. No such issue with Timeline, at least not till regularly. Having been on it for two months, I haven’t come across the concerns the majority have—at all. Here are a few I’ve heard, including in the mainstream media. My privacy is compromised. How? Timeline has exactly the same settings as Facebook had, prior to Timeline’s introduction. I didn’t like these new settings when they were introduced in mid-September, because I was used to shutting my wall off to certain people (e.g. those having a company name on a personal account—yes, I did want to hear from the company, but no, I don’t know who runs the account), but I could see the merit of having public posts which rendered such a setting irrelevant. If there was a time to complain, it was three months ago. If you’re complaining now, you’re well late. I doubt Facebook will make any changes since relatively few of us made any complaints when the privacy settings were changed last quarter. Those of us who knew were probably spending more time ﬁguring them out and protecting ourselves. People can now see what I posted x years ago at an instant. Among the changes was a setting that allowed you to restrict all past posts. That was a new privacy entry that wasn’t there before September. Use it and restrict them to yourself, or yourself and your closest friends. I never had this problem, since Facebook always had different classes of friends—at least since I joined in April 2007—and my statuses were always customized to different audiences. People can now go back to a particular year and ﬁnd out more about me. True, but see above. It’s ugly. This is one I have some sympathy with. Design is subjective, and there is some merit to the argument that Timeline introduces extra elements on to the page (see below). The rule of good design, in my book, is the reduction of elements. So in some ways, I can understand this complaint, but, I rather like the idea of a “timeline” going down the middle, and I can see why Facebook used the two columns: to minimize the need to scroll. I can’t go back to the old Facebook. I always thought it was clear that when you changed, that was it. As usual, my problems with Timeline seem to be different to those of the general public. Why two friends’ boxes? 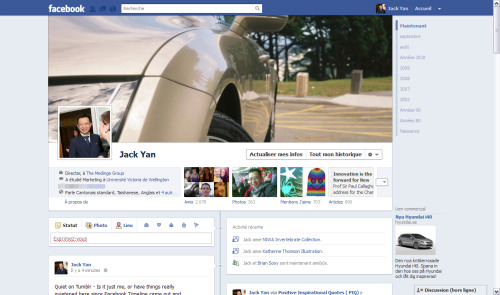 When Timeline was introduced in September, it was actually cleaner than it is now. There was one friends’ box: in the header. Last week, when it was rolled out to New Zealand, a second box was introduced that was completely superﬂuous. I joked that this was typical of American design. They start out with a clean design, like the original Buick Riviera or Oldsmobile Toronado, or even the Ford Taurus, and then they add unnecessary stuff to it and clutter it up. That’s what’s happened with Facebook. This second box is probably not helping people understand what Timeline is about, and it does contribute to its clumsy look. Amazing how one thing can ruin it, but that’s how design sometimes works. The location settings. When Facebook allowed friends to tag you at a location, it also gave us the option to approve each tag. Problem: this has never worked properly if using Mobile Facebook. Even when you change the settings to allow automatic tagging, they don’t tend to stick and the tags plain disappear regardless. Timeline doesn’t work on the 1st of each month. If you’re in New Zealand, tough luck. Your Timeline will stay frozen on the last day of the previous month for most of the day, because the new month doesn’t start until the Americans say it starts. Prior to that, the new month wouldn’t start till the Californians said it starts. Presumably, this is why the New Zealand roll-out didn’t happen on December 1. The error has been there for three months now. You can no longer use the lists properly. This was a huge surprise, when Facebook stopped me from selecting ‘Limited Proﬁle’ in any privacy setting, be it a status update or a photo album. This has still not been ﬁxed. I traced the bug to Facebook’s new inability to add fan pages to your lists. It still allows you, but beware: adding a fan page to any list will render it inaccessible for your privacy settings. Not many people seem to care about this one, though there are complaints about Facebook’s ‘Smart Lists’ on its fan page. The majority doesn’t use them, or was unaware they even existed till this year, calling Facebook copycats for taking a Google Plus feature. As mentioned above, it’s certainly been there since the mid-2000s, so I’m unsure how Facebook in 2007 managed to copy Google in 2011. I’ve got to scroll down a long way. At the time of writing, I have to scroll down six days before I can see my December summary. Before the roll-out, Facebook had this ﬁxed at a number of posts. I preferred it before—again, this lengthy scrolling is contributing to the public’s concerns about Timeline’s concept and their privacy. Despite my many misgivings about Facebook, especially about its privacy changes over the years and the imposed defaults that it got a lot of ﬂak about, I have increased my usage at the expense of Tumblr and other services. I now make public posts for the subscribers—those I choose to have outside my friends’ list. When Facebook killed my Limited Proﬁle last week, I spent some time doing a cull—I’ve cut my list down by about 80 people, including those I was on a business club with but who never shared a single Facebook post with me in two or three years. (‘I must have killed more men than Cecil B. de Mille.’) In my mind, these have all been healthy moves. Popping by others’ pages is a bit more enjoyable, seeing what graphics they have chosen for their headers, although I have spent very little time visiting. I have spent some time “ﬁlling in the gaps” over November with pre-2007 statuses and photographs for me, and adding locations to other statuses. In most of these cases, only my real friends know them: that’s the beauty of having availed myself of the privacy settings since day one—and keeping an eye on them on a very regular basis. Facebook never took a step back, so I’m afraid no matter what our complaints are, they’ll fall on deaf ears. Even after posting the solution to their newly introduced lists’ bug on to Facebook’s Lists’ Team page, they haven’t lifted a ﬁnger to ﬁx the fault—but, then, since it doesn’t affect the boss, it might never get ﬁxed. As long as their member numbers keep growing, Facebook might think itself impregnable, even if I like Timeline. Altavista once thought it would remain the number-one website in the world, too.